Gabriel Ball, Matthew Ashbourne, Jack Bower and Ella Bower represented Warwickshire in Solihull this week. They came up against 4 other counties: Birmingham, Worcestershire, Herefordshire and Shropshire. Gabriel participated in shot coming 2nd, 2 lap coming 2nd, standing long jump coming 1st and relay coming 1st. Jack participated in 2 lap, speed bounce, triple jump coming 3rd and relay coming 1st. Matthew guested shot and would have come 3rd but his score did not count and relay coming 1st. 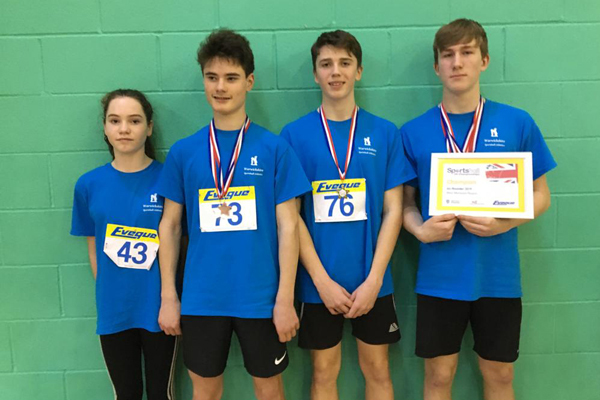 Overall the under 15 boys with Gabriel, Matthew and Jack came 1st as a team with Gabriel winning the individual overall winner. The team now earn a place in the UK finals in Manchester in April. In the under 13 girls team Ella played her part in the team wining vital points and success in her events and will also compete in the UK Finals.